National Sachertorte Day in the United States is observed on December 5. This food holiday is dedicated to a specific type of chocolate sponge cake invented by Austrian confectioner Franz Sacher. The Sachertorte is a Viennese culinary specialty, but Americans celebrate a food holiday dedicated to it because this dessert is popular all over the world. Although the original Sachertorte is only sold at authorized locations, many bakeries have their variations of the recipe. How exactly was the Sachertorte invented? In 1832, Prince Wenzel von Metternich (State Chancellor and Foreign Minister of the Austrian Empire) required that his personal chef cook a special dessert for several important guests. The chef was ill at the moment therefore the task fell to his 16-year-old apprentice, Franz Sacher. Sacher created a chocolate sponge cake with apricot jam and dark chocolate icing which is said to have delighted the guests. However, the recipe didn’t receive any immediate further attention. Having completed his training, Sacher spent some time working as a chef in Bratislava and Budapest before returning to his hometown of Vienna and opening a specialty delicatessen and wine shop. His eldest son Eduard is credited with perfecting his father’s recipe and developing the Sachertorte into its present-day form while working at the Demel bakery. After leaving the Demel bakery and founding the Hotel Sacher, Eduard Sacher began serving the Sachertorte there as the speciality of the house. After the death of Eduard’s widow Anna and the bankruptcy of the Hotel Sacher in the 1930s, a legal battle arose between the Demel bakery and the Hotel Sacher. Both establishments wanted the trademark rights for the label “The Original Sacher Torte”. The legal war lasted for 25 years (with interruptions due to the Second World War). Finally, both parties agreed to an out of court settlement in 1963. According to the settlement, “The Original Sacher Torte” is a trademarked label owned by the Hotel Sacher, while the Demel bakery has the rights to sell the Sachertorte decorated with a triangular chocolate seal that reads Eduard-Sacher-Torte. The Original Sachertorte sold by the Hotel Sacher has two thin layers of apricot jam between the chocolate sponge base and the outer layer of chocolate icing on the top and sides. It is typically served with unsweetened whipped cream. The exact recipe is a closely guarded secret. It is believed that the main secret lies in the chocolate icing made of three special types of dark chocolate, which are produced exclusively by different German and Belgian manufacturers for this sole purpose. 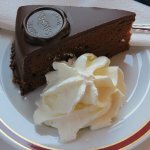 The Original Sachertorte can be bought at the Vienna and Salzburg locations of the Hotel Sacher, at the Sacher Shop in Bolzano, at Cafe Sacher branches in Graz and Innsbruk, via the hotel’s official online shop, and in the Duty Free area of the Vienna International Airport. However, your don’t have to go to Vienna in order to celebrate the National Sachertorte Day. Most bakeries have their versions of the famous cake. They may be less authentic, but chocolate cake is chocolate cake!